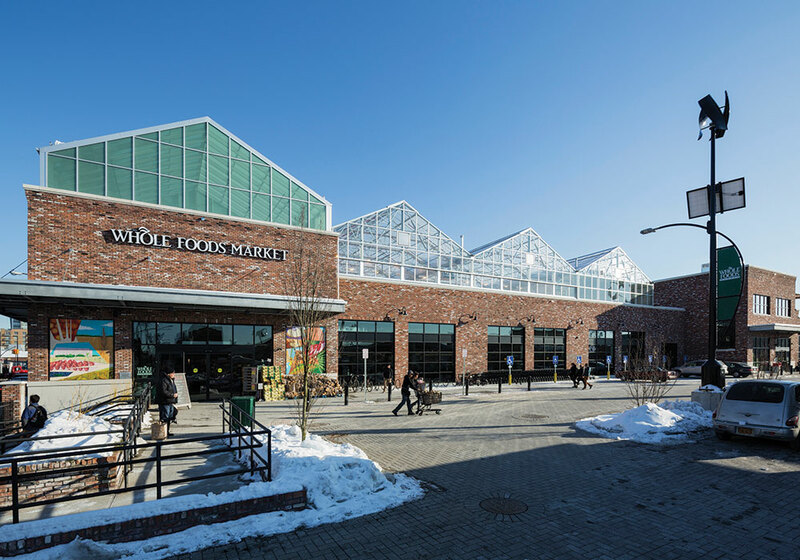 The Whole Foods grocery store in the Gowanus neighborhood of Brooklyn looks similar to most other Whole Foods, with one big exception: The building is topped with a prominent greenhouse. Visually dramatic, the greenhouse is one of four operated by a company called Gotham Greens. Three are in New York, and the newest facility is in Chicago. The Chicago greenhouse, which opened in 2015, purports to be the "world's largest rooftop farm." At more than 75,000 feet in size, it is an impressive example of urban agriculture moving to commercial scale. It sits atop a manufacturing plant for Method Products, a company that makes biodegradable cleaning products, and produces 20 million heads per year of leafy greens and herbs — the equivalent of a 50-acre, soil-based farm. Fresh, local salad greens are always in season at the Whole Foods Market in the Gowanus neighborhood of Brooklyn, New York, which boasts a massive rooftop greenhouse where produce is grown to sell in the storefront. Photo courtesy Gotham Greens. The massive rooftop greenhouse where produce is grown to sell in the storefront. Photo courtesy Gotham Greens. Gotham Greens' website speaks of the start of a new era in urban agriculture, a shift from seasonal community gardening "to a year-round, viable, commercial scale farming enterprise." Its team includes cofounders Viraj Puri and Eric Haley and chief agricultural officer Jennifer Nelkin Frymark. Gotham Greens produces a variety of greens and produce through recirculating hydroponic systems. The environmental and sustainability benefits are considerable: no pesticides or herbicides, no soil erosion (there is no soil), production that is very water and energy efficient (the greenhouses use natural daylight, and all other energy needs are met by renewable energy). And the distance food travels is minimal. In the Brooklyn greenhouse, the produce is "literally harvested in the morning and brought down through the elevator to the storefront; it doesn't get much fresher than that," Puri told me in an email. The Gotham Greens story highlights trends and potential of what might be called the "hyperlocal food movement." So much for the 100-mile diet; we're now considering the potential of the 10-foot diet! Partly fueled by a growing interest in health, sustainability, and the provenance of food, this hyperlocal food culture and economy offers an interesting partial antidote to the environmental concerns of industrial-scale farming. The new opportunities for hyperlocal are growing by the day. 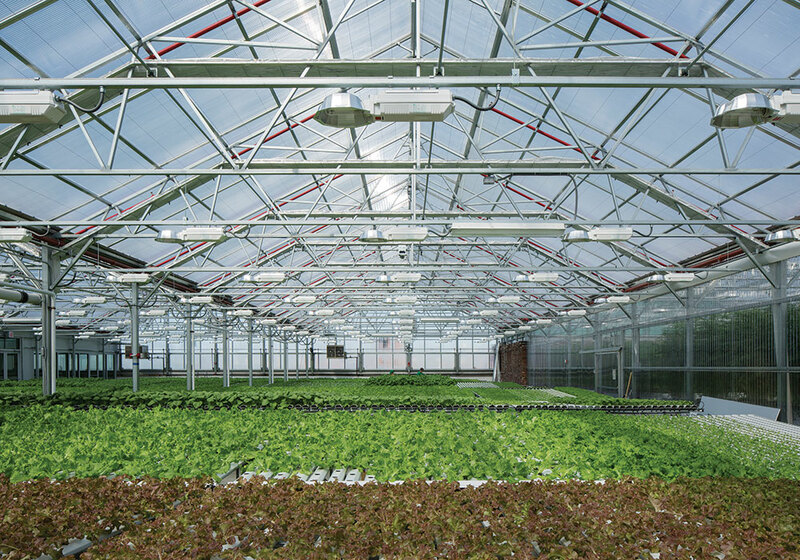 They need not be as large-scale (or commercial) as Gotham Greens' Chicago farm. New developments (so-called "agri-hoods") like Serenbe, outside Atlanta, are integrating food production into their design. Other innovative examples include office structure designs that integrate farming, like downtown Tokyo's Pasona office building, which has, among other things, a rice paddy on the ground floor and fruit trees and vegetable planters growing throughout the structure. The quality of the work environment is undoubtedly improved, and the food makes its way into the building cafeteria. Growing food in your own neighborhood is another hyperlocal opportunity. One interesting development coming out of Australia is the so-called ecoPOP: a movable, container-based system for growing produce, which is also seen as a chance to reduce the heat-load of cities and inject some green nature into hard surface urban environments. They are self-watering and even self-fertilizing (in the full size version there is a place for a worm farm where food waste can be recycled). The brainchild of Michael Mobbs (famous for his Sydney sustainable house), ecoPOPs are popping up throughout Australia. Individuals and families can also grow at least some of the food they need in and around their homes and apartments. One innovation is household aquaponics, which combines vegetable production and fish in an integrated system (with the fish waste serving as plant food). A new system developed by Grove Ecosystem, which was started by two MIT classmates, Gabe Blanchet and Jamie Byron, is currently taking preorders through Kickstarter. "Imagine a farm in every kitchen," poses the company promotional video. It is a clever system, "about the size of a bookshelf," producing food but also adding an important element of nature to our otherwise indoor lives. The basic 25-gallon system is not cheap (the discounted Kickstarter price is $3,750), but the company is working on a DIY kit with a much lower cost. Using the system will require some training, but it holds the promise of harvesting at least some of your food. An interesting element is the app, which allows you to control, via Wi-Fi, many things in the system: lighting, pump speeds, ordering tools and seeds, and communicating and sharing with other users. Already Grove Ecosystems is installing its systems in schools and offices, where they are the modern-day watercooler: People tend to gather around them. Another product, aimed at home use, is a larger, 250-gallon system that could produce 40 to 80 percent of a family's produce needs year-round. Byron believes that products like his can have a significant impact on the food system, and that climate change will make indoor production more essential. The hyperlocal food scene is changing rapidly, and holds promise for feeding us in more sustainable ways and, in the process, yet again redefining our relationships to food and its production. In post-World War II America we quickly forgot about our victory gardens, and food became an industrial commodity produced in distant places, with huge environmental impacts and a large energy footprint. That will need to change, and it is. I saw it myself at the Whole Foods in Brooklyn. I watched as shoppers snatched up packages of greens from a stand with a sign that points upward: "Grown upstairs in the rooftop greenhouse." Timothy Beatley is the Teresa Heinz Professor of Sustainable Communities at the University of Virginia, where he directs the Biophilic Cities Project.